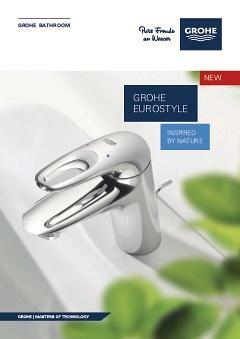 Bring out the best in any contemporary bathroom scheme with this GROHE Eurostyle basin mixer tap. Instinctive to use and easy to clean, it is perfect for family bathrooms and standard wash basins. If you’re looking for a bathroom tap that fits with a simple modern scheme then this tap is the perfect choice. It has a host of useful features, including SilkMove ceramic discs for smooth operation and water-saving EcoJoy, which cuts water usage by up to 50% without reducing water flow. The gleaming coating of scratch resistant StarLight chrome is easy to clean and has a sparkle that lasts for years. As part of the Eurostyle range of bathroom taps you will find this basin mixer effortlessly combines with other products in the same range for a complete bathroom solution. Designed for easy installation with a single tap hole, this is the perfect finishing touch.